What's the Difference and Why Do I Need Both? I have the discussion often, do I need Backup, Disaster Recovery (DR), or both? For most customers, the answer is both, but it depends on what type of disaster(s) you are protecting your infrastructure from. One size does not fit all when it comes to your data recovery options. Backup – Long term retention of multiple versions of a document. DR – Quickly recover from a full or partial disaster. Backups allow us to retain multiple versions of business data over a long period so you can retrieve a past version of a document if needed. Think of Backups as a solution to recovering a prior version of documents, or retrieving a document that was accidently deleted. Backups typically do not protect non-business data like Operating System files, settings, network configurations and user credentials. But this is possible if you need that level of protection. Restoring prior versions of all of the backup data is a manual process and can be time consuming. Cloud providers typically provide multiple tiers of data storage, with one of the less expensive tiers designated for backup data storage. Providers can provide this less expensive tier because they know for backups, the data will not be accessed very often. While cloud providers do not use tapes as their storage medium, cloud backup storage is typically stored on a slower data tier. Backups are typically less expensive than Disaster Recovery because less data is being retained. Backups typically happen only a few times a day (at most). The goal of a Disaster Recovery plan is to make copies of your business infrastructure, not just your data. A Disaster Recovery plan should ensure that if there is an infrastructure failure, all or part of the infrastructure can be quickly recovered so the business can “get back to running the business” as soon as possible. Disaster Recovery can typically protect more than just the business data, it protects Operating System files, settings, network configurations and user credentials. 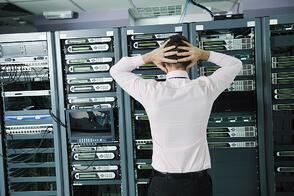 Disaster Recovery solutions are built to quickly restore all or part of business infrastructure. This can be a relatively quick restore, but usually restores to a clearly defined point in time, like 15 minutes prior to the disaster. Disaster Recovery can typically provide a near real time replica of all or part of your infrastructure. Common DR providers can typically recover data that was stored less than 15 minutes prior to the disaster. When you build your DR plan, you need to define the amount of data that is acceptable to lose, Recovery Point Objective (RPO); and the amount of time, Recovery Time Objective (RTO), it should take to put your infrastructure back in a running state. Because of the amount of data that is stored, and the cost of protecting your infrastructure in near real time, DR solutions are more expensive that Backup Solutions. DR is not intended to provide long term backups of any of the data or infrastructure. The intent of DR is to only have current point in time snapshots, e.g the last 7 days, in case the infrastructure is compromised by some sort of destruction or malware. Be sure that you can talk about your DR plans in business terms like; how quickly the infrastructure should be back up and running, and how much data loss is acceptable in the event of a disaster. Backup and Disaster Recovery protect data differently with separate intents, therefore it is prudent to ensure you have both in place to properly protect your business. As you consider your DR and backup strategies, please start by defining your backup and DR business objectives. Once you understand what you are trying to protect your infrastructure from, you can then define how to protect your infrastructure. Here is a list to help get you started. Some 3rd party providers provide a single solution that can provide both long term retention, for backups, as well as a DR solution for disasters. I've used some of these solutions and they do provide a good one size fits all, but again, you need to define your business goals first, then find your solution. Azure provides separate Backup and DR solutions that provide good solutions and are cost effective. The MyCloudIT management portal gives you the ability to deploy file based backups by understanding your business objectives, while minimizing the technical details. DR strategies are more complex and require planning. Want Future Tips Emailed Right to Your Inbox?